Adorable puppy dogs are always a hit with children. Here, we have some simple suggestions for making puppy dog birthday cakes. Cake design ideas can always be developed and adapted to suit the age and preference of the birthday child, as well as the pocket and patience of the baker! The simplest method of making a puppy dog cake is with one, moulded, figure; a more fiddly and time-consuming way is to create a heaving mess of puppies playing together. If you use a moulded cake tin, your mixture will sit and stay...until you tell it otherwise! Themed moulded baking tins-available for hire from cake shops and sold in kitchen departments-are a great way of creating the perfect outline of your child’s chosen favourite. This way, you have the choice of how to decorate and fill the cake to your taste-without the (possible) hassle of hours of elaborate sculpting...Follow the guidelines supplied with the cake tin for quantities, oven temperature and so on. Make one 18cm pudding-basin shaped cake and one 25cm basin-shaped cake, by following the recipe for Madeira Sponge in the article ‘Birthday Cakes for a First Birthday’ on this website.Once the cakes have been cooked and cooled the real creativity begins! Use a serrated knife to slice a little from the round base of the larger of the two basin-shaped cakes,if necessary, to make it ‘sit’ flat. This is important because the smaller cake will be resting on this one. For further security (especially if you think little fingers may not be able to resist touching the puppy dog) use a special plastic cake dowel-long enough to go right through to the base of the body cake-with 2-3cm protruding from the top. Remove any uneven edgy bits to leave a nice smooth head and rounded, even body shape beforehand. Fill the body cake with as many horizontal sandwich layers of butter cream, jam, or other filling, as you fancy making. Why not try a layer of jam, then butter cream, for extra ‘ooh’ factor? Watch that there isn’t too much weight though-otherwise the fillings will just squish out of the sides...When ready to decorate the cake, place the head cake securely on the body dowel. Mould the ear shapes from sugar paste-as you think fit for your party pooch! Short pointy ears, or long droopy ones (or one of each...) The puppy dog’s nose can be a single cupcake, a chocolate button, or a liquorice sweet-or whatever strikes you as right! Make 2 forepaws to tuck under the front of the body by making oval shapes in sugar paste, or use similarly shaped chocolate biscuits to go with your colours. The tail can be made with sugar paste and plumped up, or rolled thin, whichever you think suits your puppy dog cake. Use a white base of sugar paste and add black spots for a smooth, dalmatian look; a combination of white, brown and black for tricolour cuties; all black with a white eye spot for dramatic effect, and so on. 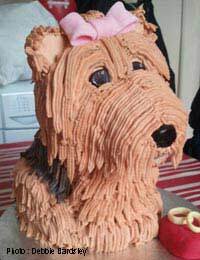 To create an illusion of a shaggy-looking, long haired, puppy, simply use a fork to make a scruffy wiggly pattern on a thick layer of freshly applied butter cream! If this seems too much to do all over the puppy, just do a few scruffy little tufts here and there-especially on the ears.